Hershey kisses are fun any time of the year, but they are pretty perfect for Valentine's Day treats. Amanda always creates the cutest printable holiday stickers for kisses and she has come up with a fun set of Valentine's kiss printables that includes a bag topper. Print them out and assemble little bags of Valentine kisses for your kids to give to their friends and teachers at school. You can get these free Valentine's Day printables over at Shindig Parties To Go. 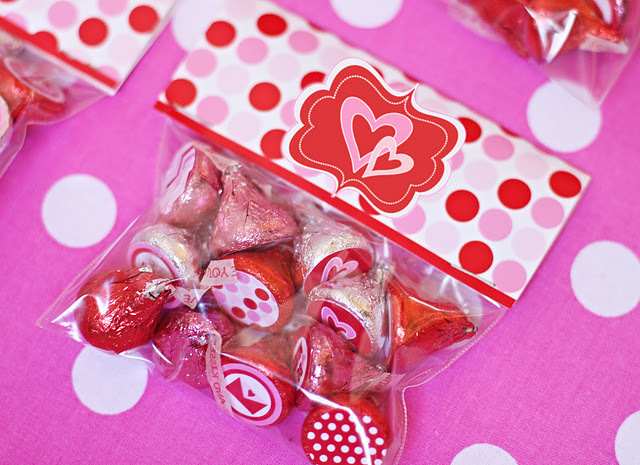 They also coordinate perfectly with Amanda's new line of Valentine's Day party printables.